Elements Applied: Green parts of the plant like leaves are utilized in medicinal purposes. Used For: The herb is applied medicinally to stop hemorrhage, like wound, cut bleeding, and any type of bleeding resulting from skin damages. The plant is widely met at the edging containers and in other areas. 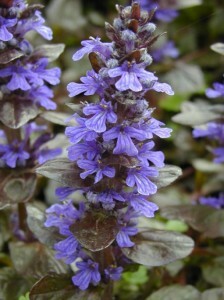 Additional Info: Bugle belongs to perennials and commonly reaches only 6 inches in height. The leaves are rough and green-colored. Bugle blossoms in July, when rose, blue or white flowers appear. There are several specially raised species like Variegata, which has green and cream leaves, and Atropupurea, which is characterized by purple leaves. Preparation and Intake: The plant is commonly used in form of infusion. Safety: There is no data concerning the plant’s safety level. Still, there is a possibility of interaction with the medicines you use. It’s necessary that you speak with your health-care provider before trying the herb.